Where have all the OLED TVs gone? One of the biggest surprises of CES has been the almost complete non-appearance of OLED TVs at this year's event. It's surprising because the internet hype-machine surrounding the new technology - which promises brighter, slimmer and more colour-accurate TVs - had let us to expect that OLED TVs you could actually buy would have a major presence at CES 2009. Pre-Christmas, some tech sites were speculating that Sony could have up to 40 OLED TVs on its stand - instead it has a handful of prototypes. "While Sharp has been exploring OLED, we have always maintained that LCD remains the best technology for consumers today and in the future." 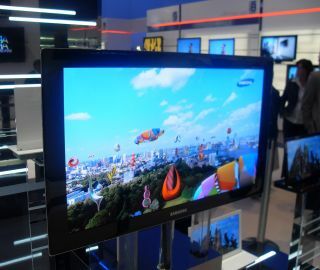 Even Samsung which has been talking up OLED TV tech of late didn't have any real TVs to show. Instead it rolled out another smattering of prototypes, including an admittedly very cool translucent OLED display. One possible reason for the no-show is the global economic downturn. People simply aren't going to reach into their pockets and spend big on a pricey, new technology (remember, Sony's 11-inch OLED, the XEL-1, costs £2,500) when they might lose their jobs tomorrow. Tech companies too, their profits slashed, are also likely to be scaling back on the technology, at least in the short-term. The other reason, of course, is a technological one. These are still early days for Organic Light Emitting Diodes (OLEDs), and making decent-sized TVs using reliable, robust and long-lasting materials isn't a milestone many TV makers have been able to reach yet. It's understandable then that TV makers are concentrating on offering slimmer versions of existing plasma and LCD technologies instead. OLED and LED technology is appearing more readily here, as the replacement backlight for fluorescent tubes in LCD TVs.